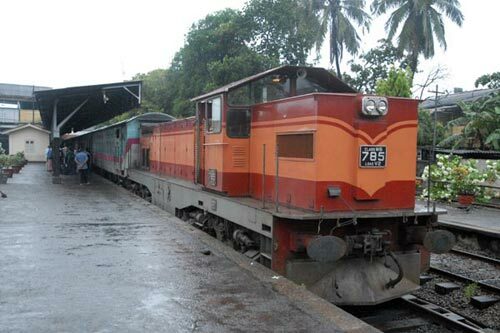 Sampling the train service between Sri Lanka's capital city Colombo and Kandy some 121 kilometres away is a delight recapturing the 'old days' of rail travel when speed was not necessarily so important. With around five trains each way per day the fastest service covers the distance in around two and a half hours if the timetable is to be believed. In reality it may take as long as four hours even on an 'express' service. Photo - Waiting departure from Colombo in the Monsoon rains. Colombo's Fort station is busy by Sri Lankan standards as it is the hub for trains operating to all parts of the country. Station facilities are adequate if a little dated with the passenger area kept very clean for this part of the world. I particularly liked the signage all neatly painted in the three official languages of Sinhalese, English and Tamil. What is needed is a fresh coat of paint to brighten up the structure which in many ways is reminiscent of similar sized stations in Britain during the 1950's. For those with more than a passing interest in railways water columns for replenishing steam locos are still in place! Arriving at Colombo Fort station just after dawn the rolling stock for the 7 a.m. Intercity Express to Kandy was propelled into the platform about ten minutes prior to scheduled departure. The train includes a rather quaint first-class observation car, a selection of first, second and third class coaches plus a first class air-conditioned carriage offering at-seat catering, free wifi and newspapers operated by Exporail where I had a reserved seat. Departure was 'on time' and we set off for Kandy in heavy monsoon rain. The effects of the deluge were immediately noticeable with swollen rivers and flooded fields. Progress on the double track mainline to Rambukkara was good affected only slightly by the busy commuter service in the vicinity of Colombo. I suspect we were running about fifteen minutes late entering the single line as we began the stiff climb up to Kandy which lies over two thousand feet above sea level. Torrential rain did not help progress and with steep uphill gradients and tight curvature wet rails meant the train came to a standstill a number of times. Superb work by the driver meant that one each occasion he managed to restart the train often travelling at walking pace as the wheels lost their grip. A couple of adverse signals approaching passing stations did little to help progress. However the slow progress couples with spectacular but rather damp scenery added to the trip and I am sure there were very few passengers complaining as we rolled into the destination in a few minutes under four hours or about 80 minutes late! The journey had been completed at an average speed of about 30 km/h which is pretty unimpressive for a crack intercity express. However the road journey takes about the same if driven with care. Had the booked 150 minute schedule been maintained then it would have been a high speed journey for an island where speed is not possible between centres of habitation. Sadly this was the only journey completed on this visit and the system as a whole is worth riding especially the mountain section from Kandy to Badulla. However be warned trains on this section are slower and still manage to lose time! Patience is obviously needed although the lack of speed means you can fully appreciate the ever changing views through the windows. Next time I will spend more time enjoying the delights of Sri Lankan Railways.